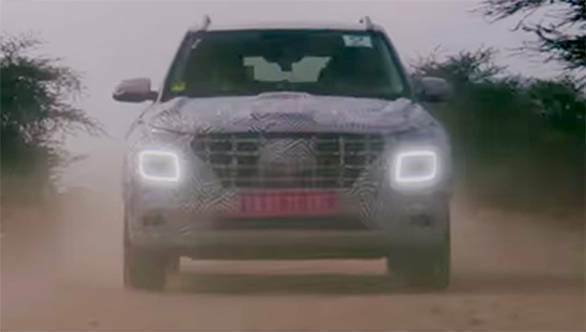 Hyundai India is gearing up to launch its first compact sub-4m SUV, the Venue, which will be unveiled on April 17. The Hyundai Venue SUV will be the Korean car manufacturer's answer to the likes of the Tata Nexon, Ford EcoSport, Maruti Suzuki Vitara Brezza and also the newly launched Mahindra XUV300. The Hyundai Venue will be India's first connected car that will sport Hyundai's Blue Link connectivity suite which boasts of 33 features, out of which 10 have been designed specifically for India. The features will cover the safety, convenience and other vehicle management information. Post its introduction in the Venue, Hyundai will also equip its other cars in the portfolio with Blue Link connectivity. This system makes use of a tamperproof device that is connected to the cloud using an in-built eSIM and works with the Vodafone network in India. We hear that the Hyundai Venue will be offered with a two-year standard subscription to Blue Link, post which, the car owners can choose to renew the subscription at an annual fee. 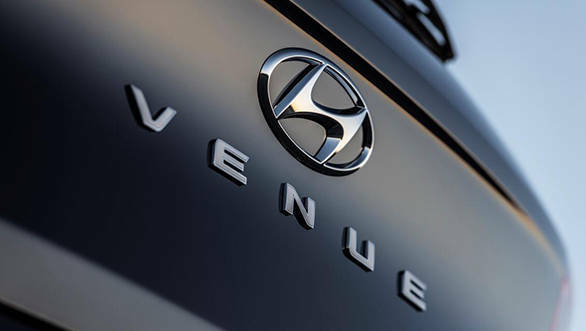 We expect the details of the annual subscription to be revealed around the launch of the Hyundai Venue. The Blue Link-equipped variants of the Hyundai Venue will come with a smart inside rear view mirror that will feature three buttons viz. SOS, RSA and Blue Link. The SOS (Save our Souls) button can contact emergency services, and send out panic notifications to phone numbers preset by the vehicle user. The RSA switch calls for roadside assistance in case of a breakdown, flat tyre, towing requirement, emergency fuel, lost key etc. The Blue Link button connects to the Hyundai call centre assistance. All the three services make use of Blue Link's ability to automatically share vehicle status and location, thus adding to safety and convenience. Furthermore, in case of an accident where the airbag(s) of the Venue is deployed, the system will also automatically send a notification to the emergency services informing about the location of the crash. We have seen a similar system in the Ford Sync system that is integrated in the EcoSport. 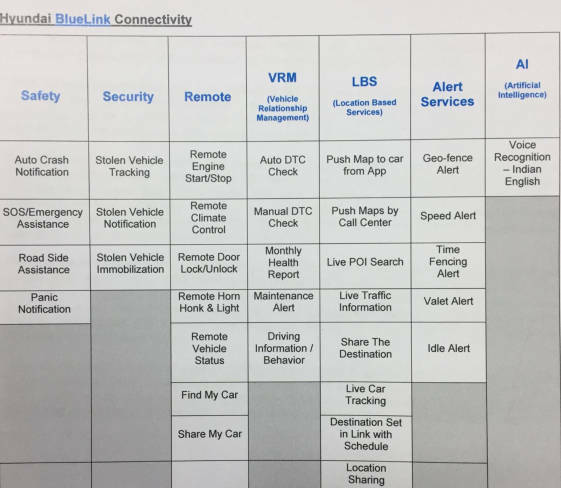 Using the Blue Link smartphone application one can also access various safety features like vehicle theft tracking, engine immobiliser for stolen vehicle recovery, high-speed alert, geofence alert, panic notification, location sharing and others. Additionally, one can also remotely operate functions like engine start/stop, climate control, door lock/unlock, switching on/off headlights and locating the vehicle using the BlueLink application. The owner of the vehicle can also add contacts of friends and family members who will receive an emergency notification in case of any mishap. The Hyundai Venue's Blue Link module will also feature cloud-based voice recognition. Hyundai claims that it has been developed to understand various local Indian accents for the English language, to make it convenient for all the Indian customers located in the different parts of the country. 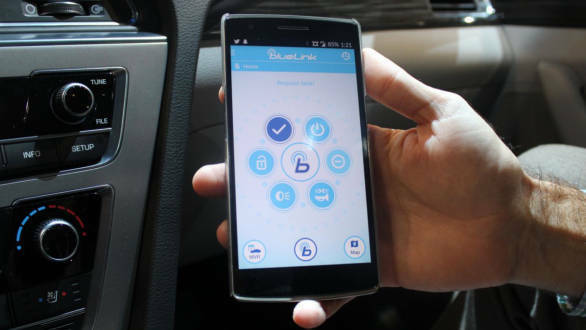 The Hyundai BlueLink will be compatible with iOS, Android, Amazon Alexa and Google Assistant.. The system will be able to provide real-time traffic updates and live local search. What to expect from the Hyundai Venue Sub-four meter SUV?